For many years, my favorite chunky peanut butter cookies were these Get Well Soon Cookies; but this morning I was tempted to try another version. The recipe is called Peanut Butter Blowouts. I’ve seen the recipe for “Blowouts” in a few places including Midwest Living, where the key add-ins are Reese’s Miniatures and honey roasted peanuts. As usual, I didn’t have any honey roasted peanuts, but I did have plenty of Reese’s plus a hodgepodge of other nuts. I also threw in some M&Ms, which I highly recommend. They add texture and color and you can theme the colors to suit the occasion: Back to School with school colors, Halloween, Christmas…whatever. The Blowout dough is milder in flavor than the Get Well Soon dough, but it pairs well with the loads of chunky nuts and candy and may be more suitable for people who like peanut butter but don’t love it. In short, this is yet another good recipe for when you want to shove a lot of candy into dough and bake it into deliciousness. 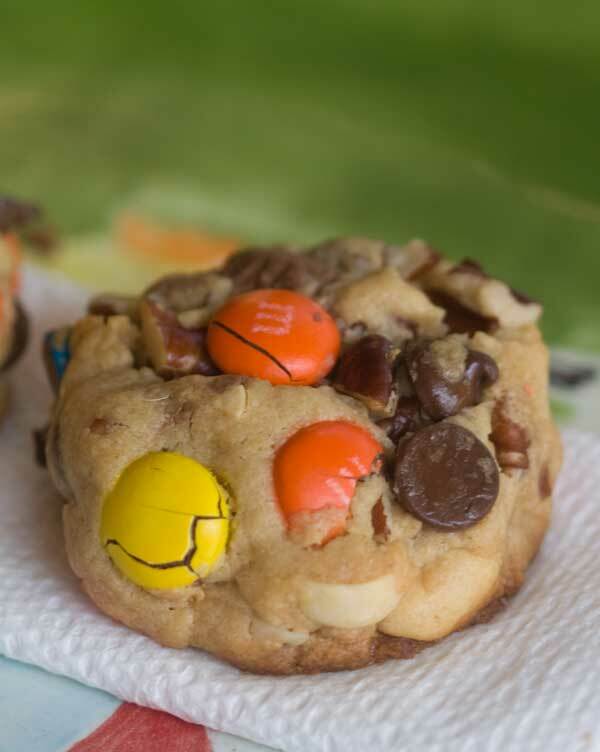 Soft peanut butter cookies loaded with chips, peanut butter cups, nuts and M&Ms. Preheat the oven to 375 degrees F. Line two cookie sheets with foil or leave them ungreased. In a mixing bowl, beat the butter until creamy. Beat in the peanut butter until mixed. Add both sugars and beat until creamy, then beat in the vanilla, egg and milk. Scrape sides of bowl and beat in the salt and baking soda. Add the flour and stir with a spoon until mixed. Stir in the chocolate chips, M&Ms, miniature Reese's and nuts. The dough should be packed with chunks. Using a level tablespoon or heaping teaspoon, shape dough into balls and arrange on the baking sheets spacing 2 1/2 inches apart. Bake for about 10 minutes or until cookies appear set. Let cool on baking sheet for 10 minutes, then transfer to wire rack to cool. If for some reason you are out of baking soda, you can make these with baking powder instead. Hooray! Hope you have fun, here. Feel free to email me if you want some personal recommendations. I just found your blog and I don’t know where to begin! I have about 50 cookie recipes on my blog and am always looking for fun new recipes. This looks like a great recipe! I really need to blow out my stash (of stuff I can’t eat anymore) in the cupboard and make some cookies. Love the thick look of these and that they are full of goodies. Carol, I’ve tried it and it’s good stuff! The one I usually buy is JIF Natural because it has more of a molasses flavor. Paula, let me know how yours turn out! These are similar to a recipe I have made before, but I have never added milk. I’ll have to try this recipe. I will use the excuse that my boys would love them, but really I know I would just as much! Ever tried Reese’s peanut butter? It is harder to find but I love it! Uh, wish it wasn’t getting close to my bedtime or I’d be running to the market for some candy to be making these. They look fabulous and I will pick up all the missing ingredients and do some baking tomorrow. Can’t wait to sink my teeth into peanut butter yumminess amped up with M&M’s and Reese’s Pieces, thanks for the recipe! Thanks for the comments! Amy, I’ll have to bring you one because I definitely plan on baking them again. I really wasn’t sure I’d like them because of the milk in the dough and the fact I prefer crispy cookies, but the cookies exceeded my expectations by a longshot. Cecelia, they may not be great with just nuts. The dough by itself is just kind of “meh” but the texture and way it bakes up is perfecting for holding a lot of add-ins. I’m not really a ‘throw in everything and the kitchen sink!’ cookie person, but your description of the dough sounds great. I may make these just with nuts and see if they please my picky brother. Wow these look awesome! I love chunky cookies.